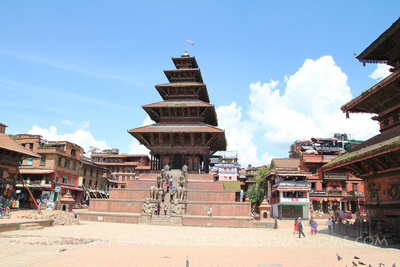 An ancient square containing one of Nepal's tallest temples! Taumadhi Square is located next to Bhaktapur Durbar Square. It's the second most visited square in Bhaktapur after Durbar Square. 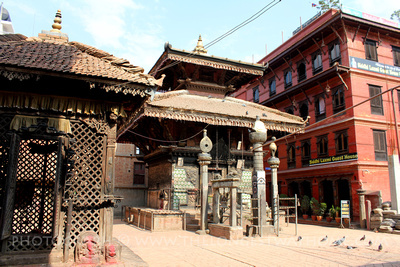 Taumadhi Square is often referred to as Taumadhi Tole which is because "tole" means "market street area" in Nepali. It is also very close to Pottery Square which can be visited on the way here from Durbar Square. 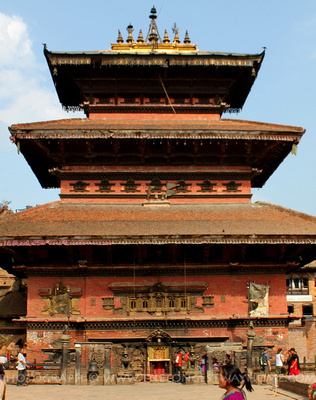 Taumadhi Tole contains the tallest temple in the Kathmandu Valley - the Nyatapola Temple. The square has an open central area with two major temples to the north and east. Other old buildings in the square are largely residential homes to local residents. It's here that you can appreciate ancient life and "living herigate" in Bhaktapur quite well. However, do note that the pagoda styled building near the center of Taumadhi square is not a temple! It's a modern day restaurant. It does give great views from the top but there are other restaurants equally as good nearby. 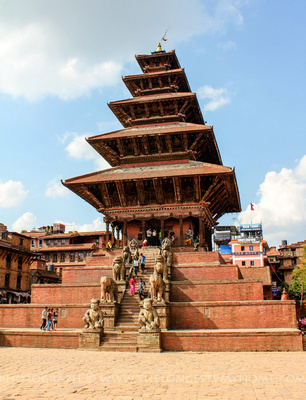 Taumadhi Square connects directly to Bhaktapur Durbar Square while also leading to Potters Square and an old road leading to Dattatreya Square. In 2019 work is expected to be carried out on the roof of the Bhairabnath temple within the square. 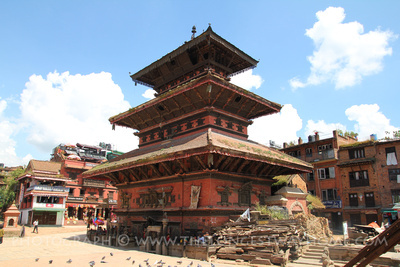 If you are visiting Taumadhi square in Bhaktapur I highly recommend you download my guidebook. It includes a fantastic heritage walk around the square and photographs of every temple so you'll never be confused as to what's what again! Built by King Bhupatindra Malla in 1702 the five-storey, 30m-high stone building survived even the 1934 & 2015 earthquakes. You are free to climb the mighty stairway leading up the temple. It is said that each of the guardians on either side are ten times stronger than the ones under it. At the bottom plinth are the wrestlers Jayamel and Phattu who we will meet later on in Dattatreya square. Above them are two elephants, followed by two lions, then two griffins and finally the tantric goddesses Byaghrini and Singhini. The large Bhairabnath Temple is far more interesting from the outside than inside. Kasi Vishwanath or Akash Bhairab is a trouble making stubborn god who is not so happy to even be in the temple. The small brass figure at the open shrine in front of the temple is Bhairab himself and makes for a great photo. When you walk around the Bhairabnath Temple you will see a set of wooden cart wheels and planks of wood to the left. These items belong to the large wooden chariot which is assembled every year to bring Bhairab, or rather the box which contains his head, around during the Bisket Festival (April). The roof of this temple is due for replacement in 2019 and some work will be carried out on the building. closed so little is missed here. This is one of the "hidden temples" of Bhaktapur, located behind the dancing platform in Taumadhi square (the wide raised brick platform in the southern end of Taumadhi square). Inside this courtyard is the main double roofed Narayan (Vishnu) Temple, one of the oldest in the valley. An inscription here reads 1080 AD. This is backed up by the image that is inside it which has 12th century styling. Other attractions around the main square include the brick dancing platform opposite the Nyatapola temple and the surrounding souvenir stalls. If you get my downloadable guide to Bhaktapur it contains every temple in the square and beyond: all laid out in a great walking tour. Get my Bhaktapur guidebook here. The current fee for foreigners is included in your overall Bhaktapur ticket price. This ticket covers all of Bhaktapur including, Bhaktapur Durbar Square, Pottery Square, Taumadhi Square and Dyattraya Tole. If you are planning to stay in Bhaktapur show your passport at the ticket office and you can get the same ticket extended for one week with no extra cost. Ticket booths are located at all the main entrance streets into the old city of Bhaktapur and there are random "ticket inspections" so do hold on to your ticket! There are very few hotels within Taumadhi square itself though most are just a minute or two walk away. Most nearby hotels are in Durbar Square or on the road between Taumadhi square to Potters square. There are none! Most hotels in the square are of a mid-level quality so don't let anyone tell you differently. Looking for more accommodation in Bhaktapur? Try my hotel search below for the best rates. There are quite a few restaurants and cafes around Taumadhi square, it's also very walkable to other areas around Bhaktapur. Unfortunately restaurant quality or service is not the best. Cafe Nyatapola: A long-standing restaurant located in what looks like a temple opposite the Nyatapola Temple. It’s the views that really attract. Everything else is overpriced. Namaste Restaurant: Go here for breakfast as it’s probably the best you’ll find in Bhaktapur. Fruit salad, lemon crêpes or a huge bowl of King Curd sourced locally. Located beside Nyatapola Temple the views are great & dinners are only okay. The staﬀ are not so great aside from the manageress, Sarala who is great - say hi to her from me. De Gurka: Reasonably priced with reasonable food with a rename in 2017... the management could do with some customer care training though. Bhadagaon Cafe: Is it a coffee shop, sestaurant or hotel. It's all three really, but hard to tell sometimes. Hotel staff are lovely, cafe staff are pretentious. Foods good though. From Bhaktapur Durbar Square simply walk passed the lions at the end of the square and take the first right down the narrow street - it leads directly into Taumadhi Square. Alternatively from behind the Pashupatinath temple in Bhaktapur Durbar Square take a left and continue walking to Taumadhi. Full sized maps available in my guidebooks.